We recently sat down with Garry Gilliam, one of Fenagh’s top AWS and ICC Certified Structural Steel and Welding Inspectors. Garry is responsible for executing many of our high level visual and ultrasonic welding inspections, as well as our high strength bolting inspections. He has been an iron worker and welder since 1999 and has worked on many large projects including the Atlanta Falcons and Cincinnati Bengals football stadiums. As a welder, Garry worked with many inspectors. Over time, he developed a desire to become an inspector himself, as an opportunity to move his career forward. Since passing the certification exam, he’s worked on some of the largest private and publicly funded construction projects in North America. So what does a typical day look like for a Welding and Steel Inspector like Garry? Garry begins most days by going over his reports. 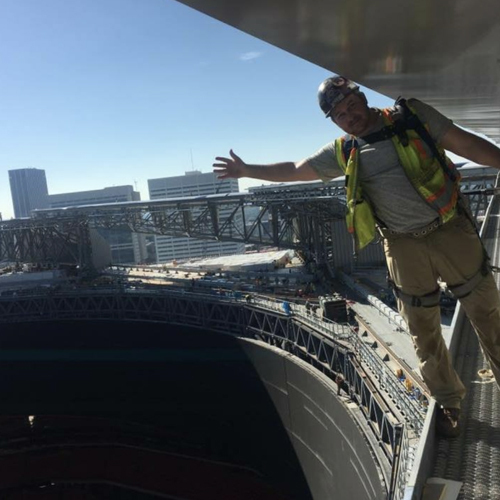 Recently, he has been performing inspections on the Encore Boston Harbor project in Everett, utilizing Autodesk BIM 360 software. BIM 360 is a platform that connects your project data in real-time from design through construction, allowing for more informed decision-making and leading to more predictable, profitable, and efficient outcomes. Garry uses the software to look over QA/QC and Issue reports, creating himself a roadmap of any current issues open for reinspection. He uses his remaining preparation time to review his most recent e-mails for open inspection item updates. After reviewing open inspection items, Garry will walk the job site to identify where in-process welding is taking place. When welding operations are observed, he’ll verify set up of welding rods, that the correct welding procedures are being followed, and that all welders are properly certified for the project at hand. In the most frequent cases, when Garry is dispatched to inspect a completed welding activity, he will review the most current construction documents, then proceed to his on-site inspection. For a welding inspection, he’ll perform an initial visual inspection verifying complicity with AWS standards. If the weld in question is a complete joint penetration weld, Garry will then also perform nondestructive testing, using the ultrasonic inspection method. This method allows our inspectors to thoroughly inspect the integrity and condition of welds and structural steel without damaging the product. Garry’s favorite part about working at Fenagh is the opportunity to further his career with a rapidly growing company. Garry is encouraged by Fenagh’s upcoming national construction projects, and the growth potential for him and the entire Fenagh team. Garry also applauded Fenagh for the opportunity to further his career through the high level, hands on training he has received from Fenagh’s professional engineers and ASNT Level III NDT Structural Steel Supervisor, Raymond Wolf, who has over three decades of experience. When Garry arrived at Fenagh, he didn’t have his ultrasonic weld testing certification. Through Fenagh’s internal mentoring and certification program, Garry was able to receive the necessary hands-on training he needed. As Garry mentioned, we’re always willing to invest in our employees’ growth and willingness to gain industry knowledge. If you’re interested in learning more about how you can join the Fenagh team, check out our Employment page and Apply Today! Great Guy and a very hard worker! M GO BLUE! Very interesting information. I look forward to working with your team as a CWI in the future.